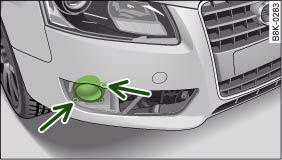 The description for changing the bulb refers to the right fog light; in principle the same procedure applies to the left fog light. – Switch off the ignition and the lights. – Detach the trim cover ⇒ fig. 298 (pull it carefully in the direction of the arrow). – Remove the two securing screws ⇒ fig. 299 and pull the fog light unit out of the bumper. The trim cover is secured to the bumper by several retaining hooks. Do not use force when removing the trim cover to avoid damaging it. 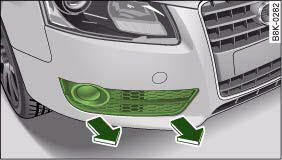 – Turn the bulb holder anti-clockwise and take it out of the fog light housing. 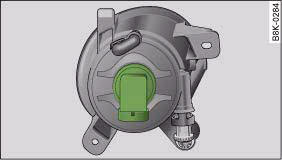 – Insert the new bulb holder and turn it clockwise as far as the stop. After changing the bulb re-install all parts in the reverse sequence and check that the bulb is working.